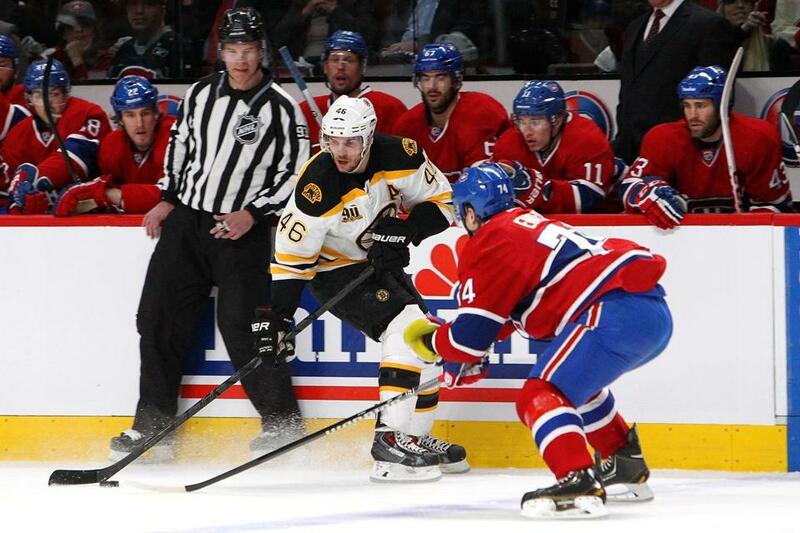 David Krejci has been too quiet for the Bruins in the series vs. the Canadiens. MONTREAL — The Bruins needed nearly half of Tuesday night’s game in the Bell Centre, roughly 30 minutes on the game clock, to feel their legs. By that time, the Canadiens controlled a 2-0 lead (soon to be 3-0) and were all but guaranteed a 2-1 edge in the playoff series, the Bruins left scratching gloved hands across their helmets for answers. Game 4 is back here in Cathedral Glorieux Thursday night, and the Bruins are still scratching. Nor did much of the second, and ergo, nor did the rest of the night. By Julien’s eye, the Bruins were short on “awareness,’’ in particular young defenseman Dougie Hamilton, who was caught in a post-Cinco de Mayo siesta at the end of a Boston power play late in the first period. Hamilton lost track of P.K. “Hurricane” Subban, who came storming out of the penalty box, collected a pinpoint Lars Eller dish, and barreled in alone on Boston goalie Tuukka Rask — Hamilton in Subban’s wake — to bury the 2-0 lead. Fast. Ferocious. Destructive. From the time Subban jumped out of the box to the time he knocked home the forehander: six seconds. The sight of the celebrating Subban was something to behold, the sellout crowd of 21,273 deliriously wrapping its arms around the devastating force of nature in the No. 76 CH sweater. Sensational theater for the home crowd and another brutal lesson for the Bruins: As Subban goes, so go the Habs, who now stand two victories from a date in the Stanley Cup semifinals. The Bruins, meanwhile, are getting big performances from no one in this series. If Subban is a hurricane, they’ve been but a dust storm, other than the sand they kicked late in the third period to salvage Game 2. That futility especially points to the No. 1 line centered by David Krejci. Normally a money guy in the postseason, Krejci has been all but bankrupt (0-3—3) through eight playoff games. He went 0-0—0 for a second time in this series Tuesday night and also logged an abysmal 4 for 14 (29 percent) at the faceoff dot. In three games vs. the Habs, Krejci has averaged almost 24 minutes in ice time, collected but one assist, landed seven shots on net, and stands an ineffective minus-2. His linemates, Milan Lucic on the left and Jarome Iginla on the right, have combined for only 2-2—4. The Bruins’ trademark is to be a heavy team, strong and intimidating, often in possession of the puck and in charge of game flow. Thus far their No. 1 line looks slow, out of synch, a virtual nonfactor. While the Habs were flying in Game 3, especially the first 30 minutes, the Bruins were flat — and no one was flatter than the Lucic-Krejci-Iginla trio. Julien, who typically varies little from his go-to lineup, especially within a game, likely will start Game 4 with that trio intact. But if the club’s start is tepid again, and the Habs once more take an early lead, he could be inclined to tinker. It’s highly unlikely he would alter his No. 2 unit centered by Patrice Bergeron, with Brad Marchand and Reilly Smith the wingers. A logical move would be to mix and match Line 1 and Line 3, which on Tuesday had Carl Soderberg between Daniel Paille and Loui Eriksson. That trio didn’t score in Game 3, but it did squeeze off eight of the 28 shots that landed on Carey Price (Bergeron took a team-high 10 and landed a half-dozen). Julien also must consider what happens if he stands pat and the results are the same. He believes in his players. He believes in his methodology. He should, because those beliefs and the top-notch goaltending of Tim Thomas brought his Bruins a Stanley Cup in 2011. But right now, the methodology appears stale and Rask’s goaltending, by no means bad, has not been nearly what it was in Round 1 when he stifled the Red Wings. Keep in mind, he has allowed only one more goal than Price in this series, albeit with Price facing substantially more shots (113 vs. 86). Julien isn’t about to swap in Chad Johnson for Rask. Of all the changes to consider, his most likely is to bring Matt Bartkowski back into the mix (subbing for Andrej Meszaros), with an eye on better puck movement from the back end, and then shuffling the Line 1 and 3 parts if the Habs again jump out to the early lead. One option would be a simple tradeout of the bigger, heavier Soderberg for Krejci. Or, perhaps prior to that, try Eriksson as Krejci’s right winger, kicking Iginla down to the Paille-Soderberg combination. Fourth line brothers Gregory Campbell and Shawn Thornton would stay intact, although Julien could opt for Justin Florek instead of Jordan Caron as their left winger. Not a move of much consequence. In three games, the Bruins each time have entered the third period with a deficit, something that hasn’t happened to them since Games 4, 5, and 6 of their ill-fated series vs. the Flyers in 2010. They took a 3-0 lead in that series, then watched their Cup hopes fade away in a historic four-game meltdown. They also lost Krejci to a hand injury (and subsequent surgery) in the thick of the meltdown. They haven’t lost Krejci in this series. Not yet. But they need the astute, effective version of himself back in a hurry. It is true in every playoff series that a team’s best players must lead the way, and other than Bergeron, Boston’s best players have been barely mediocre. In large part, that is why the Habs have all but owned the clock in this series. In some 205 minutes played in three games (including the Game 1 double OT), the Habs have led for a combined time of 107:11, or 52 percent of the action. The Bruins have led for a mere 11:39, or 5.6 percent of the time. Lead time isn’t necessarily an indication of how a game or series has been played, but in this case it’s a fair barometer. If anything, it might indicate that the Bruins are fortunate to be in a position to pull even with a win in Game 4. Kevin Paul Dupont can be reached at dupont@globe.com. Follow him on Twitter @GlobeKPD.